Gigi will be hosting an event in London this Saturday (February 18th) at Tommy Hilfiger on 63-65 Brompton Road SW3 1DB to launch her Spring/Summer 2017 line. A peek at Gigi Hadid’s new clothing line with Tommy Hilfiger in this latest lookbook video for summer! It was only a matter of time before Gigi Hadid tried her hand at designing — she’s already conquered the rest of the fashion world, right? But what we really respect is that the supermodel is creating a collection for a brand she truly loves: Tommy Hilfiger. Gigi wears pieces by the iconic American label both on the street and on the red carpet, and she was the leader of the pack at the Spring ’16 show. We all know that Gigi Hadid can put together the perfect outfit, but can she make the perfect dish? Thankfully, we wont have to guess for much longer, as Gigi Hadid guest starring on MasterChef is soon to become a reality. The 20-year-old model is set to appear on Gordon Ramsey’s reality show TONIGHT (Jan. 18 at 8 PM EST). According to People, Hadid will battle it out with fellow friend and Victoria’s Secret model Devon Windsor on the “Celebrity Showdown” episode. While this may sound like loads of fun, it is also a serious gig as the women are competing for $25,000 to donate to their charity of choice — Hadid’s being the Global Lyme Disease Alliance in support of her mother, Yolanda Foster, and Windsor’s being the St. Louis Children’s Hospital. While she might be a bit nervous, Hadid seems to be a natural in the kitchen. How do I know this? Because of the Real Housewives Of Beverly Hills, of course. In the fifth episode of the sixth season, Hadid can be seen expertly whipping up some tomato soup and “grilled cheese dippers.” I’m getting hungry just thinking about it! Gigi will appear on Lip Sync Battle Season 2, check out the trailer below..
Cody Simpson certainly celebrated his 18th birthday in style. 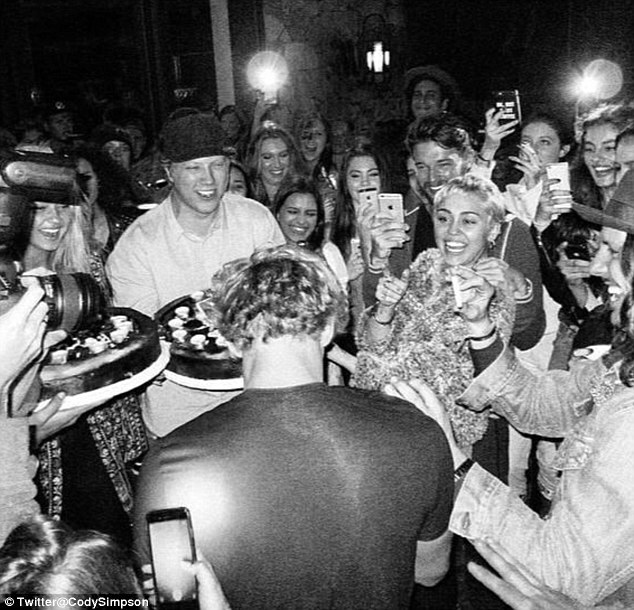 Surrounded by close friends on Sunday, the Australian singer was joined by the likes of girlfriend Gigi Hadid and US musician Miley Cyrus for the celebrations in Los Angeles. Taking to Twitter on Monday, the blonde heart throb shared a photo of his big night, along with the caption: ‘Thank you to everyone who helped me celebrate my 18th last night, grateful for such great mates’.